The AirBnB rental is up for The Bachelor mansion so it's time to take this dating on the road. First stop: Lake Tahoe, Nevada. Or if you're a contestant on this show: Tahoooooooooe!! For his first 1-on-1 date, Arie takes Seinne parasailing which allows for appropriate "let it go" metaphors of love for about 35 seconds of airtime. Then they drink champagne and talk about Arie's brother's wedding and how he wanted a date with her since night one. Dinner is at the Hard Rock Hotel & Casino where they switch to wine and talk about Arie's hesitance for real relationships after getting dumped by Emily. Seinne talks about her parent's difficult relationship and her race being underrepresented when it comes to love stories. 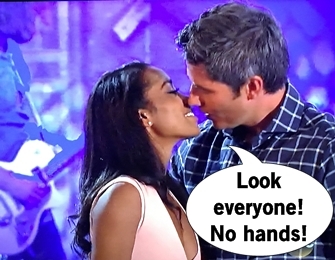 Despite this being very boring to watch, a connection is made and Arie gives Seinne the rose and then brings her to a horrible concert to dance in front of a crowd. Arie acknowledges it's a bummer Maquel had to leave due to her grandfather's death, but the group date must go one. It's a wilderness preparedness date where Arie pretends to drink pee, the girls eat bugs, and then the date splits into three groups to hike to their final destination. Everyone arrives at the idyllic cabin and strip right down to their swimsuits for time in the hot tub where Krystal stakes her prey while the others look on. Krystal is just sooo exhausted by the others girls being desperate and obnoxious to be seen, yet all she talks about is trying to get time with Arie to be noticed and then when she gets her time mopes about the women being jealous of her. The girls loathe Krystal, culminating in Tia and Caroline being confronted by Krystal for making her feel bad. For a minute I thought the date rose would go to taxidermy lover Kendall who came alive in her element, but Tia gets the group date rose for being open and vulnerable. Bekah gets the last date of the week and the girls are super gossipy about Bekah being 14 years younger than Arie. Arie doesn't quite know this yet so it's a good thing he takes her to ride horses and not out to try and rent a car. In the midst of some hot tub smooching, Bekah feels Arie's scar which he explains was part of a car accident while racing. Over dinner, Bekah and Arie agree the conversation flows naturally between them plus there's a ton of chemistry. Arie worries he's at a different stage of life being an old man who wakes up with the sunshine and Bekah might still want to party. Then comes the big reveal which Bekah is scared to share: 22. It shocks Arie that she's so young and worries if she's ready for marriage at the end of this. To that I say, Arie... are you even ready for marriage at the end of this? Bekah tries to reassure Arie but he's completely freaked out that a woman he's falling for might not have experienced enough life to want to settle down already. Arie decides to take the risk and gives Bekah the rose. It's almost elimination time and Krystal yet again is going on about needing time with Arie. Chris Harrison rolls up to drop the news that there will be no cocktail party and they're heading right to a Rose Ceremony. Chris Harrison tells Arie the women are shocked and dismayed which sort of seems like an overstatement, but that's what Chris does best. 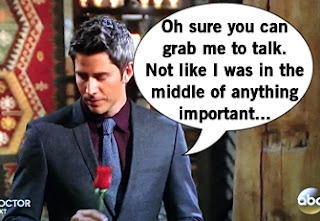 Arie heads out to begin the Rose Ceremony but is interrupted by none other than Krystal who needs time to say yet again she feels a connection. WE GET IT. Arie and Krystal head back to the main room and the Rose Ceremony commences. Krystal gets the last rose of the evening because we've seen this show enough to know the common tropes. The night ends with the elimination Caroline and Brittany T who got just enough airtime to maybe end up on a Bachelor spinoff.